Now I'm serious this time: "Riot!" will be a WoW machinima video which mostly is about a riot. Of people. So, mostly, I need the characters to just appear like normal modern people, like the ones you see in Real Life. 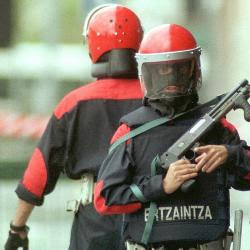 Also, I'll need an specific kind of riot control police, the Ertzaintza. As for the rest, I'll be using the rp_oviscity_v2d (?) map for GMod and other important stuff (I know about the rest, don't worry, I wasn't born yesterday). The Ertzaintza guys are these. I'll need of course a big variety of footage for this, mostly made in front of the green-screen CG thing (I mean, just the characters with the CG green behind). For the Riot Control (Police): Mostly shield-bashing the multitude, getting their plastic-shields on them (shield-blocking), smashing people with their blunts and shooting their shotguns. Whatever a riot can have. For the citizens and the riot: Not much, just footage about those people running away, BUT looking back. Just a few of this, as it mostly will be just stock WoW animations. And if that's the case, I'll need skins for the gear, like t-shirts, the police gear, and some other stuff. I don't know if I'm asking too much, but any help will be appreciated. As I don't know any 3D rendering stuff. This is Free Dwarf Studios guy, out. You are basically asking for a total conversion of wow's graphics; animation, models, and textures. I'd say that's a bit much seeing as I often can't even find someone to help with the technical aspects of such processes even when I do all of the art asset work myself. So, yeah, a bit too much probably. Honestly, reading your post I have a hard time figuring out why you even want to use wow characters if you don't want them to look or move like wow characters. I guess. Well, se you on [email protected] I might explain around this.